The present church building dates back to 1230, although there was almost certainly a church, probably made of wood, on the same site before this date. It is dedicated to St. Swithun, who was the Anglo-Saxon Bishop of Winchester. The deluge of rain that followed the moving of his body into a tomb in the newly constructed Cathedral on 15th July 971, led to the tradition that if it rained on 15th July, named St Swithun’s Day, then it would rain for the next 40 days. In 1201, the manor of Swanbourne (together with Mursley) was granted by Hugh Mallet and his wife Margaret to the Cistercian Abbey at Woburn ‘in pure and perpetual alms, with the church of Swanbourn, to be held of him and his heirs for ever’. In 1218, the Abbey presented Robertus Passelewe as the first recorded vicar. The last resident vicar was James Mathers, who died in post in 1965, after which time the Rector of Mursley has also been vicar of Swanbourne. The original church consisted of Nave, Chancel and Tower. The North Aisle was added some time in the 16th Century. The Tower was rebuilt in perpendicular style on its same foundations by the early 17th century. The South wall was rebuilt in 1632, the date being clearly visible above the porch. A major restoration was undertaken in 1863, and the present porch was added in 1874. 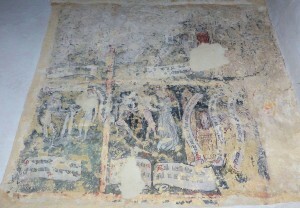 Remains of Medieval paintings in St Swithun’s Church, Swanbourne. 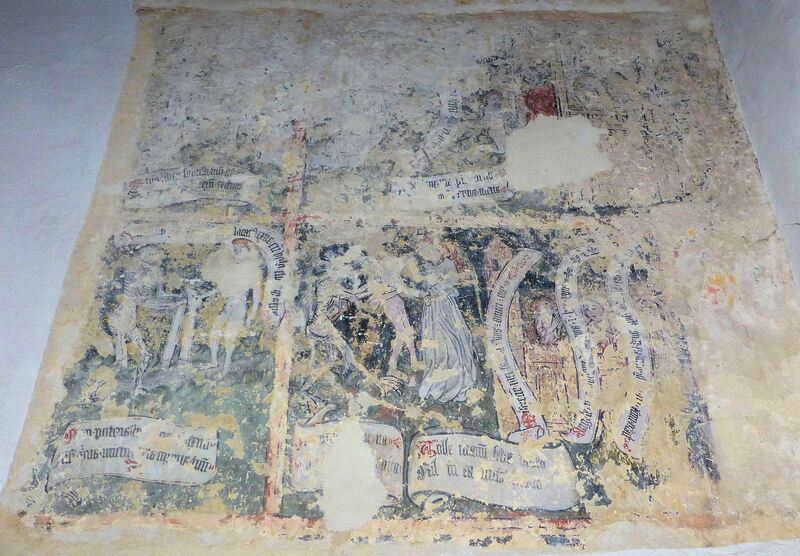 There is a ‘doom’ wall painting visible behind the altar, representing ‘The Four Last Things’, i.e. Heaven, Hell, Death and Judgement. There are also remnants of red paint visible on some of the pillars, indicating that the whole church was once highly decorated. The church has many memorials to the various Lords of the Manor and members of their families, the three oldest being in the floor of the chancel for members of the Adams family. These include a brass commemorating Thomas Adams who was murdered in 1626. Other wall plaques in the Nave are linked with names of Deverell, Askew and Penn, as well as more members of the Adams family. The Chancel has a variety of memorials to members of the Fremantle family, who have dominated the village since their arrival in the village in 1798. These include one to Vice-Admiral Thomas Frances Fremantle, who fought at Copenhagen and Trafalgar, and his wife Elizabeth Mary (better known as Betsey Wynne). There is also a plaque to their son, also Thomas Francis Fremantle, who became the 1st LordCottesloe, and to his son the 2nd Lord Cottesloe. A plaque to the 3rd Lord Cottesloe is in the nave near the South door. 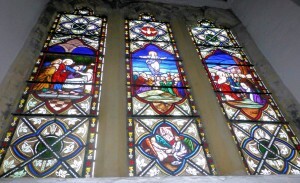 The Chancel also has stained glass windows. 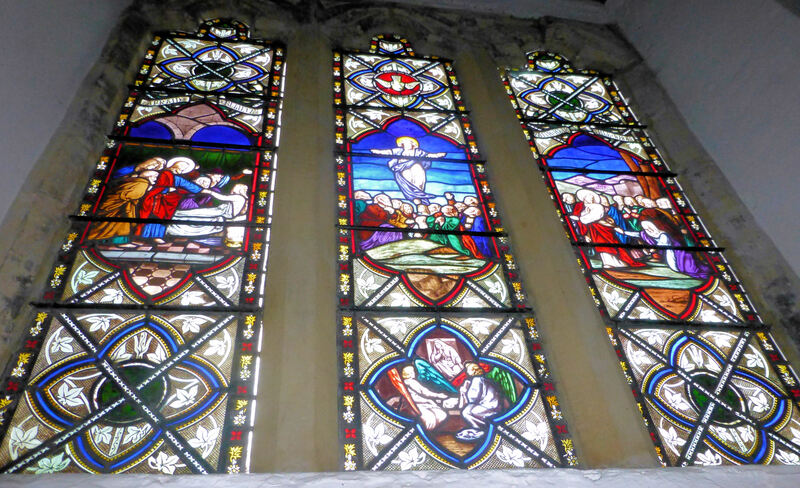 The three East windows commemorate the 50th wedding anniversary of the 1st Lord and Lady Cottesloe in 1874, and have scenes illustrating the Marriage of Cana, Mary and John at the foot of the cross and the Last Supper. Other windows in the North wall are to St Cecilia, St Phoebe and St Stephen, and in the South walls to St Paul, the Virgin and Child and St John. In the churchyard, to the right of the porch, is a tomb to the Godwin brothers, William and Nicholas, who left money for the setting up of the first school in the village, started in 1707.